"Wonderful decorative quality 1930s Grimwades Royal Winton Chintz Art Deco large charger or tray, with the popular and sought after Hazel pattern. Good examples of attractive and stylish chintz decoration is the Royal Winton hallmark - highly collectable. The Hazel pattern number 2208 (black background) is one of the most popular patterns with collectors and was introduced around 1934. With a white background the pattern is known as Spring and with a yellow background Welbeck. A very special piece - this charger is the only example we have seen and the largest display piece we have offered in this pattern. One for the very best, discerning, cottage chintz collector." Antiques Expert Hamilton Bear. References: English cottage chintz style from Royal Winton was produced from circa 1925-1960 when this form of all over multicoloured lithographic decoration was an extremely popular product line with a number of Staffordshire makers. This despite the painstaking and skilled way these 'paper' pattern sheets had to be cut out and applied by hand to all manner of blank white pottery shapes. 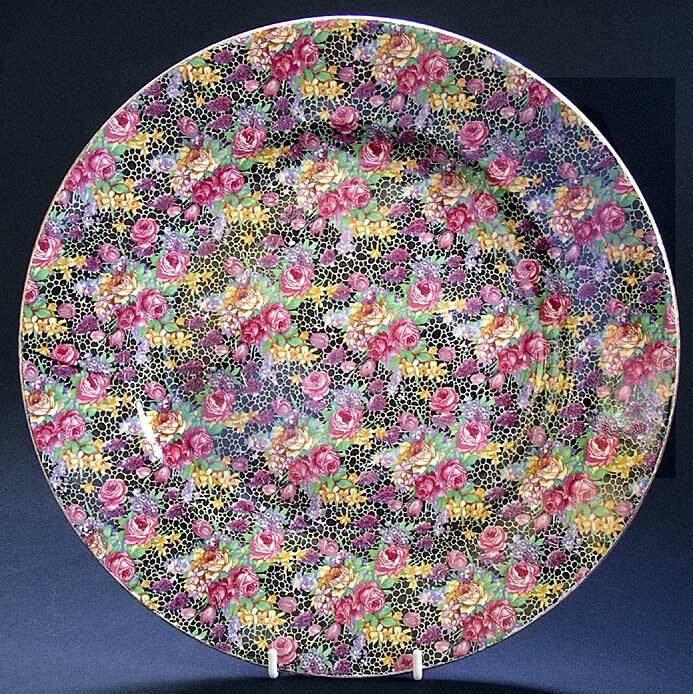 Royal Winton chintz style is considered by collectors to be among the very best. Dimensions: width 315 mm max. a little under 12 1/4 inches. Marks: to base including pattern number illustrated. Condition: Excellent for display - the pattern is bright and colourful with no fading or wear. One flat flake chip to the reverse edge has been filled and painted. 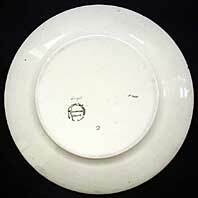 This is not visible from the front display side of the plate. There is typical rubbing to the gold painted edge rim in places.